I thought I’d share with you some more of the handmade items I had for sale at last weekend’s Christmas Market. I’m always on the look-out for new ideas of gifts and decor to make for Christmas time; hopefully these will give you some inspiration! The buckle on the Santa box is made using the retired Curly Label punch and small Curly Label – but you could substitute them with the Square punch and/or Square Framelits, or anything else you have on hand. 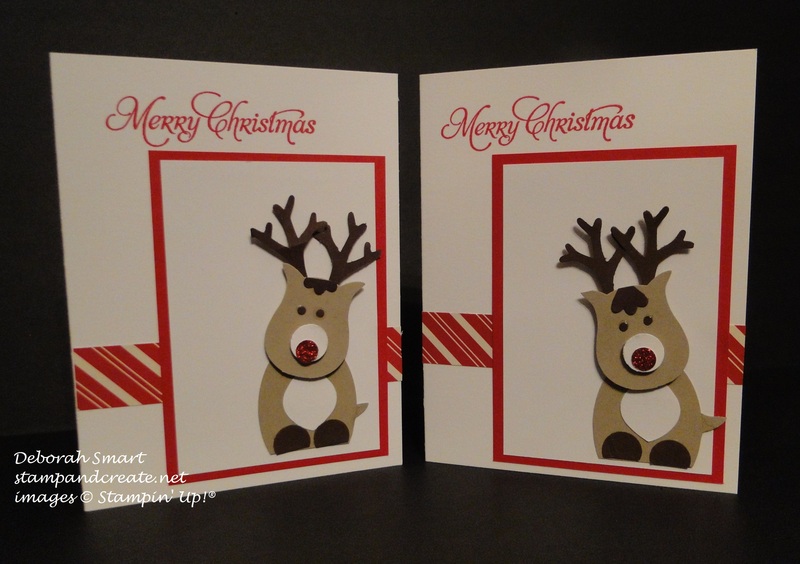 The Silver Glimmer paper adds a great ‘pop’ with the Black and Real Red cardstock. 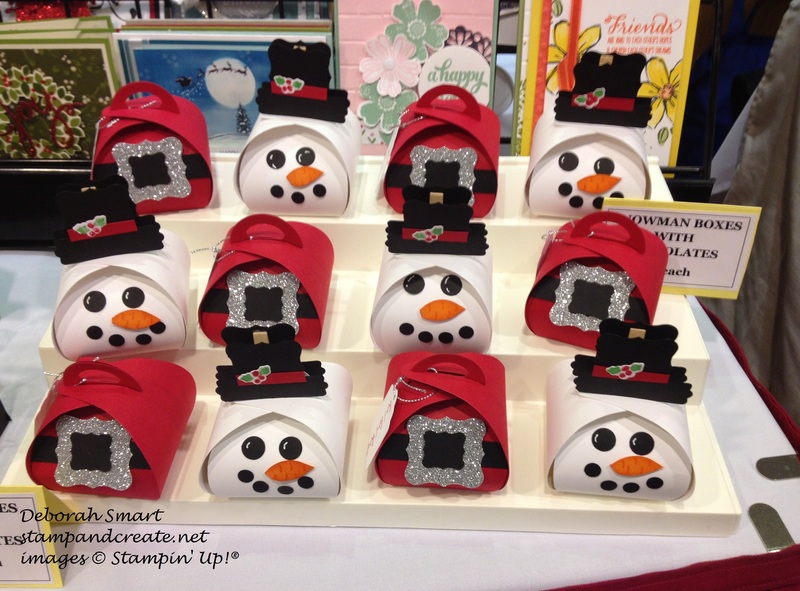 The snowman hat again uses the retired Curly Label punch for the top part of the hat, but you could use the Decorative Label punch, and just cut it in half. The brim of the hat is made using another retired punch, but the Word Window punch would work just as well. I cut a strip of Real Red cardstock for the hat band, and the added the holly from the Snow Place stamp set, die cut using the Snow Friends Framelits Dies. This next card is super cute, and again – easy to make! The punch art is what takes the longest time to put together. This reindeer just shows you one more way to use the fabulous Owl Builder Punch. The reindeer head is the body of the owl, with the feet removed; the eyes and red nose are also punched from the Owl Builder punch. The antlers are from the Tree Builder Punch; the body is a Large Oval, the white muzzle is the 1/2″ Circle Punch; the feet are the 1″ Circle Punch with the bottom cut off; the white chest patch is from the retired Blossom Builder Punch (you could substitute a petal from either the Flower Medallion or Fun Flower punch), and the tail is one of the ears from the body of the Owl Builder punch. I almost forgot – for the little patch of hair on his head, I used another retired punch, but you could create it using pieces of 7/8″ Scallop punch. The cardstock I used are Whisper White, Crumb Cake, Early Espresso and Red Glimmer Paper. For my last project sharing today, these are some ornaments that I made. I had made some last year as well; for this year, I simply used some of the new stamp sets and dies from this year’s catalogue. This one (above) used the Sleigh Ride Edgelits, Whisper White and Smoky Slate cardstock, and Silver Glimmer Paper. The snow is left over from the To You and Yours Shaker Cards Project Kit. 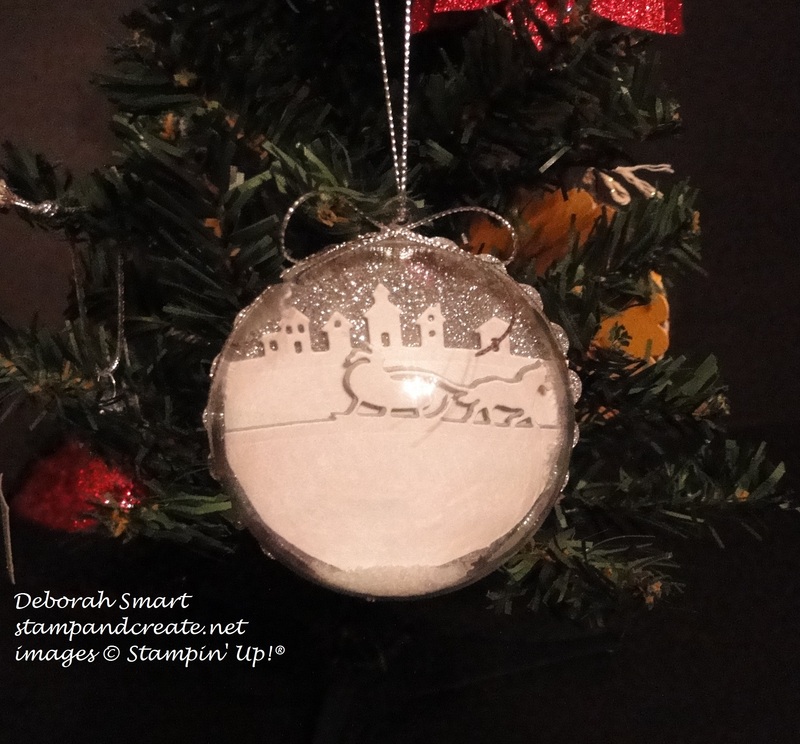 The ornament is 1/2 of a full globe ornament from a big box store; I attached my die cuts to a circle backing, then attached it to a large scalloped circle in Silver Glimmer paper, and glued it to my ornament. Our Silver Cording Trim is the perfect accent to tie it off! 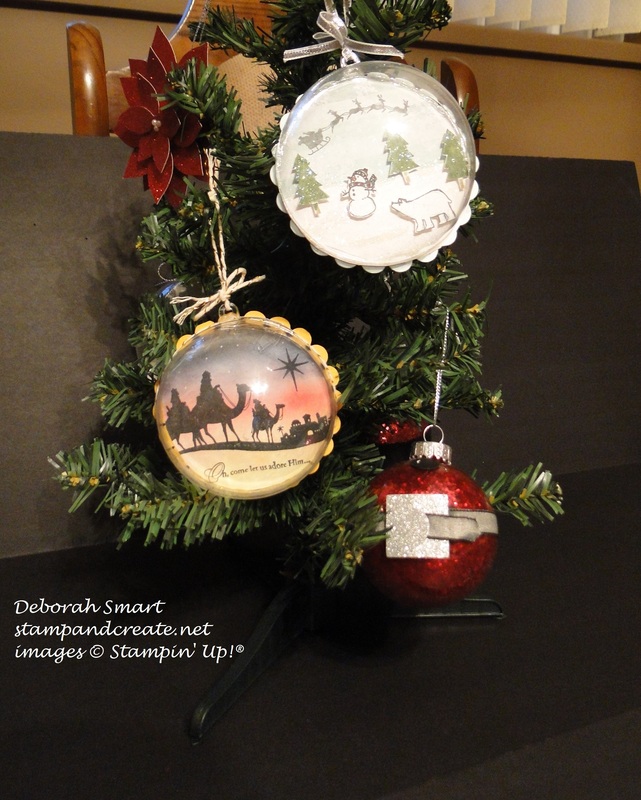 The top ornament was made using the White Christmas stamp set (found in the Annual catalogue), and the middle one was made using a set retired a couple of years ago – I think it was called First Christmas; I would check, but I lent it to one of my customers! The bottom ornament is made to look like a Santa belly; I filled the inside of a glass ornament with red glitter, and added a belt of black ribbon and buckle silver glimmer paper. That’s it for today! I hope you enjoyed seeing some more projects, and got some inspiration for yourself. I’d love to read any comments if you’d like to leave one for me. Previous Previous post: ONLINE EXTRAVAGANZA!! Next Next post: IT ALL STARTS NOW – ONLINE EXTRAVAGANZA!